"how have british youth been represented through different media in the london riots"
look at a variety of newspapers and draw quotes and paraphases what they are saying/ watch videos online from sky/BBC/ video phone footage. 6.36pm: Matt Wells writes that there are developments in a number of areas around London at the moment. Two Guardian reporters have been in touch with news of a large disturbance in Peckham, south-east London. Police are blocking the main street in the area. Adam Vaughan says there are about 50 young men, some in ski masks and balaclavas on Rye Lane. James Walsh is hearing reports of shops shutting down across the city, including those around the Angel, Islington, in north London as well as Stoke Newington, to the north-east, Wood Green – scene of looting on Sunday morning– and Lewisham, in the south-east of the city. In Islington, branches of Sainsbury's, Tesco, Waitrose and the Co-operative have all closed their doors. On Stoke Newington High Street, the Sainsbury's store has pulled its shutters down, as have some of the smaller shops and corner shops. "There's a really odd, gloomy feeling – everyone is just standing around talking about when it will kick off here", James says. The Victoria line has been suspended between Stockwell and Brixton "due to civil unrest", according to this picture. 6.41pm: PenGuy has used Blottr to post photos from Lewisham. The images show groups of youths, and police, on the streets. In one a chair appears to have been thrown across the road. On Twitter @gillianhawke has posted an image from Lewisham showing a police line blocking a road. The line appears to be preventing a bus from passing. Officers are not wearing riot gear, suggesting the disturbances may be low level at the moment. 6.45pm: Dave Hill, the Guardian's London blogger, is in Hackney, east London, where skirmishes have been occurring this afternoon. A local police officer said shops in Hackney began closing their shutters after hearing "rumours" of trouble initially emanating from BlackBerry Messenger exchanges. Most had locked up by early afternoon as support officers began arriving in increasing numbers in the vicinity of Hackney Central railway station and three masked youths riding bicycles appeared on the main shopping thoroughfare of Mare Street. A series of stand-offs with members of the public began shortly after a large group of police detained two men against the wall of Hackney's Old Town Hall building, now a betting shop, and a crowd gathered to watch, many of them photographing the events. After some brief skirmishes and an angry verbal tirade against a police cluster by a young woman in the graveyard to the rear of the betting shop, an officer shouted to a colleague to "get the Natos," a reference to riot helmets. Police vehicles and officers in helmets holding riot shields eventually blocked off access to Mare Street south of its pedestrianized Narrow Way section and the railway bridge, as buses backed up along adjoining Amhurst Road and a helicopter buzzed overhead. Reactions of onlookers varied from a man telling an officer moving a youth on to "get your hands off him, pig," to an afterschool club worker declaring to police that "these kids shouldn't be out here, they should be back in their yard," and saying that if she was in charge of dealing with rioters she'd "tear gas their asses". 6.51pm: The news channels are showing pictures of fires having broken out in Lewisham. It appears a car and a row of bins, all along the same street, have been set ablaze. The footage shows police officers dragging large wheely bins which are not on fire away from the others, as officers with shields and Nato helmets form a line behind them. From the helicopter footage there is no sign of any people in the immediate area. The police have cleared Mare Street but have told me the rioters have broken into groups. One group appears to have gone down Morning Lane which is currently protected by three police lines plus horses. I got through to the second line where the sergeant said there is continued rioting further down but can't get closer. The other main trouble is "up at the top", which I think means top of Mare Street. 7.01pm: The Observer editor John Mulholland is in Hackney, and he reports that violence has flared once again. walking around with spoils of their looting, swigging from bottles of Martell. Youths just arriving chant "Bethnal Green" and appear to be joining the affray, moving south down Mare Street from Hackney to Cambridge Heath Road. Pale, the owner of the looted Texaco garage on mare street, told me: "They just barged in, took everything ... that's 24 years of my life gone. I've never seen anything like that. I didn't try and stop them, my life is worth more than that." Even the Co-operative Funeral Care Home on Mare Street is boarded up - next door they are looting the Cash X-Change. 7.03pm: Paul Lewis has published his BBM details in a bid to understand what is happening around the capital. We're grateful for any BBM messages you might be able to send, which will be used in confidence. Paul's BBM name is 'Paul', and his PIN number is 22416EC1. 7.05pm: The news copters are showing that fires are continuing in Lewisham. These are not blazes to the extent that we saw in Tottenham. They look to be small fires which appear to have been started in or near dustbins, although it looks as if two cars, metres away from the bins, are also ablaze. In Lewisham town centre – not immediately near the fires – police are lined up across the main street. 7.07pm: Separate pictures show a small fire in Hackney. A wooden pallet appears to be part of the blaze. A small group of people are stood nearby. 7.11pm: A Twitter update from Sky's crime correspondent, Martin Brunt, on the death of Mark Duggan. Brunt's sources say police fired two shots: one bullet hit Duggan, the second missed or went through him into a police colleague's radio. This clears up the confusion about the bullet lodged in the officer's radio – initial reports suggested it may not have been fired by police. Importantly, Brunt reports that the officers involved in the incident have never claimed they were fired upon first. According to Brunt, the firearms officer who shot Duggan apparently feared his life was in danger from a lethal weapon. 7.13pm: John Mulholland reports that "police have regained control of Mare Street, at least for now". There are still large numbers of masked youths in the area. Car burned out on Ellingfort road off Mare Street. A policeman says they are busy 'sterilising the area'. 7.14pm: Sandra Laville reports that the weapon being carried by Mark Duggan on Thursday was a converted handgun capable of firing real ammunition. Expedited forensic tests are being carried out on the handgun found at the scene of Duggan's fatal shooting and bullets fired by the police. It is understood that ballistics experts have established that the firearm being carried in the minicab was a lethal weapon. It was a handgun which once in its life had not been capable of firing – a replica, a starting pistol or a collector's weapon. But the firearm had been converted – as many illegal firearms purchased on the street are – in order to carry live ammunition. The IPCC has said that they hope to have a fuller ballistics picture within 24 hours. But it is understood to be a complex picture, involving a number of tests to establish trajectory of bullets and how many were fired. According to Sky the C019 firearms officer has said that he never claimed Duggan had shot at him. The firearms officer is understood to have told investigators that he opened fire because he believed he was in danger from a lethal weapon. Two shots were fired, it is understood; one hit Duggan and one missed lodging in another officer's radio. Forensic tests will establish finally whether Duggan fired his weapon at all during the attempted arrest on Thursday evening. Rachel Cerfontyne, the IPCC commissioner in charge of the independent investigation into Duggan's fatal shooting said: "IPCC investigators are currently liaising with scientists at the Forensic Science Service regarding analysis on ballistics. We would anticipate being in a position to share verified results within the next 24 hours." The Guardian reported on Monday that initial ballistics tests on a bullet found lodged in a firearms officer's police radio was a police issue bullet – indicating that Duggan had not opened fire at the officer. Establishing precisely what happened when Trident officers, supported by members of the Met's specialist firearms unit stopped the minicab carrying Duggan on Thursday evening relies heavily on the ballistics results and the trajectory on the bullets fired. Tests are also carried out to establish the range at which the shots were fired at Duggan. The Met police joined the IPCC to say that any suggestion he was killed in an execution style shooting by shots to the head was "inflammatory" and inaccurate. The family of Mark Duggan is being kept up to date with developments, the IPCC said yesterday. Cerfontyne said the family's concerns were not about contact with the IPCC but the lack of contact from the police in delivering news of his death to Duggan's parents. "In the course of our contact (with the family) I know that the family – and indeed the community still have many unanswered questions," Cerfontyne said. 7.19pm: Television pictures now showing a building ablaze in south London. It began with a small blaze outside what looked to be a terraced house, but the flames quickly spread and now appear to have engulfed all three floors. The row of terraces contains a Gregg's which is next to the blaze. Helicopter footage shows people exiting the neighbouring buildings via fire exits at the rear and clambering over rooftops to safety. 7.23pm: The fire is in Peckham, both BBC and Sky have confirmed. It appears to have spread to the Greggs next door and looks in danger of engulfing the entire building. Lot of smoke. 7.27pm: Peckham: The fire has spread through the the back of the building. Fire engines are slowly working their way towards the building, but it looks as if police are having to ensure the street is secure before the fire brigade can get in close. 7.30pm: Peckham: fire crews have now arrived and are attempting to put out the blaze. 7.36pm: Tweet by @sallygainsbury – "Leaflet found outside Dalston Argos this a.m: advises on disposing of clothes,avoiding arrest http://yfrog.com/h07mxcyzj"
There is group of several hundred people on the streets, members of which have just looted an ABC pharmacy in middle of Peckham. A line of riot police have just charged the group, and it seems as if we're now in a running battle with the police. It's a very tense situation. Over last the couple of hours the group had smashed windows while a bus was burnt out and at least four other buses damaged after they had been abandoned. 7.48pm: Lisa O'Carroll reports that a "general air of panic" has descended on Camberwell, just a mile or two from both Peckham and Brixton. One restaurant has already taken precaution of boarding up his windows in the event of trouble and hundreds of people disgorged from buses are walking church street in both directions. Several knots of youths wearing black scarves around their mouths are walking away while other on bikes are weaving in and out of traffic heading towards elephant and castle. 7.51pm: Helicopter pictures now showing clashes between police and protesters in Hackney. Police and rioters can be seen lining up at opposite ends of a wide street in Hackney, with the occasional missile being thrown. Police edging forward slowly. Hard to know where to report on at the moment. Meanwhile the journalist Joseph Stashko is accumulating news from Lewisham in this Storify page. 7.56pm: Paul Lewis is tweeting from Hackney – here's his last few updates. Big crowd of few hundred youths here (Catford is about a mile or so from Lewisham centre) now. Police in riot gear, lots of taunts and scuffles. 8.07pm: It appears the violence may now have spread to Birmingham. Martin Wainwright reports"
The first sign of trouble spreading beyond the London area came in Birmingham where up to 200 youths confronted a police cordon in the city centre and shop windows were smashed. Eyewitnesses said that police appeared to have the situation under control and it "does not look like London." An exclusion zone was established up to half a mile round the Bullring shopping centre which closed early. Youths wearing hoods and scarves gathered after rumours on social network sites and via texts that things were "going to kick off" in the Midlands city Bins were thrown through the windows of Jessops, LA Fitness and a McDonald's but attempts to follow this up by looting as in Tottenham and another parts of the capital were stopped by police. The West Midlands force said that extra officers had been deployed after Tweets and other internet messages spread messages during the afternoon. A pub landlord stood on guard at his doors during a brief flurry of missile throwing but by 7.30pm the police appeared to be in control of most of the city centre, with the large Pallisades mall by New Street station also closed and cordoned off. This Tumblr account appears to have been set up to document the trouble in Birmingham. It shows shop windows smashed. The pictures are time-stamped from this afternoon. On Twitter @leestanleybhm tells me the Orange shop in Birmingham was attacked. He says he saw "people running from police and police donning public order kit". 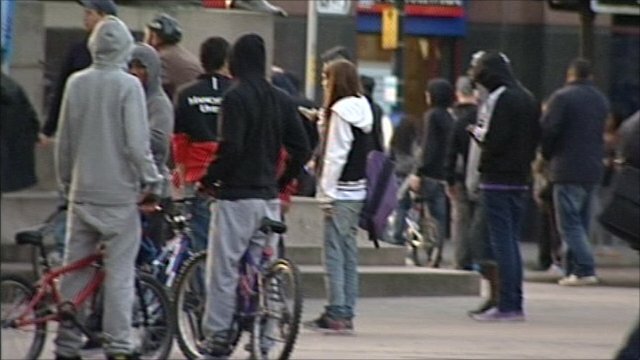 @BeckyJohnsonITV has also posted: "Hundreds of young ppl on streets in Birmingham. 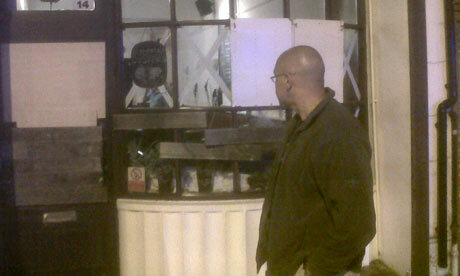 damage to shop fronts"
8.14pm: Kilburn, in north west London, has also seen trouble reports Simon Rodgers. He says there have been 20 arrests near Kilburn High Road. Youths are roaming around the area, Simon says. 8.20pm: Met police acting commissioner Tim Godwin is speaking outside Scotland Yard. Godwin urges parents to begin contacting their children. He police to be able to do their job on the streets. He says we are seeing "communities blighted by the actions of a few". Godwin says police are publishing CCTV footage and other images of those who may be involved in the violence. He urges Londoners to get in touch with police in a bid to identify those involved. 8.23pm: Streets in Croydon are "in complete lockdown" according to the Croydon Guardian. Paul says youths were setting fire to cars on the estate for an hour before police arrived. Once police did get here attention turned and anger "became more focussed on the police", Paul says. Journalists are not welcome either – Paul has witnessed four reporters being attacked - one quite severely. 8.39pm: As the violence worsened Downing Street said that David Cameron had no plans to cut short his holiday in Tuscany, reports the Guardian's Nick Watt. One source said: "The prime minister is watching it. He is keeping a close eye on it and getting constant updates. Theresa May is back, Boris Johnson is cutting short his holiday and Nick Clegg is in town." 8.43pm: Jo Adetunji is in Hackney. At five lane junction outside the Three Sisters pub a police car just tried to drive down a road blocked by a gang of youths. The windscreen was smashed and pelted with bricks before the driver managed to speed off. Someone screamed that the police car had run a person over but it wasn't the case. Extremely dangerous for any police to go near. 8.46pm: Violence is escalating on the Pembury estate in Hackney. Here is a selection of Paul Lewis's recent tweets from the scene. We have to report, as you have seen from your own media coverage, that there is significant disorder breaking out in a number of our communities across London . As a result of that we have a lot of police officers on duty . But I do urge now that parents start contacting their children and asking themselves where their children are . There are far too many spectators who are getting in the way of the police operations to tackle criminal thuggery and burglary . And I am imploring that people within those communities actually start clearing the streets to enable my police officers to deal with the criminality that is occurring in front of them. I can understand grievances and we've heard lots of debate about what the various issues are that are making people commit these acts . But what I have seen is pure violence, is pure gratuitous violence it is criminal damage and it is burglary . I and my officers will pursue all those engaged in criminality and we will put them in front of the courts and we will be asking the courts to send down significant sentences in relation to this form of activity. There are many thousands of young people in London who do not commit crime and we are seeing this is blighted by the actions of a few. But I do implore we do ask to clear the way for us to allow us to arrest those that are engaged in that activity. Grievances, concerns, challenges in communities are things we ought to be talking about. They are conversations we need to have. It does not in any way excuse the levels of violence, the levels of damage and offences that are being committed. I can reassure Londoners we have a lot of police officers out there. We remain steadfast and determined. I have a lot of very brave officers who will continue to police this. Just give us the space now to deal with the people that are doing it. 9.01pm: A large building in Croydon is ablaze. Very intense fire. More shortly. There was a tense situation in the Chapeltown area of Leeds where police were called after a man was shot and suffered facial injuries. Up to 100 youths, some wearing masks, gathered in the area which has seen street violence in the past but has enjoyed a better reputation in the past decade. The UK's second biggest Caribbean carnival is held in the local Potternewton Park on August bank holiday with a parade through the city centre. 9.19pm: The prime minister will return to London, the BBC is reporting. He will fly overnight. Earlier Downing Street said Cameron had no plans to cut short his holiday. 9.26pm: Peter Walker has more from Catford. I just watched an extraordinary scene in Catford, maybe half a mile from the main trouble. With the police occupied a small group of young men decided to kick down the door of a Halfords store, in full view of the busy South Circular road. As they tried and tried - the shutters were tough - a crowd formed, and cars stopped. One young woman leaned out of her car, laughing: "Satnav! I want a satnav!" she yelled at them. Eventually - maybe 20 minutes later - riot police with dogs arrived and the slower-running looters (some people did carry off goods) were caught. Earlier Peter told me he overheard a police inspector saying on a radio that the trouble in Catford is the work of 150 people at most. "But the trouble is, they're so mobile," he told his boss. "You clear them out and they pop up somewhere else." 9.39pm: Video apparently showing looting occurring in Birmingham. Full scale looting going on at Clarence convenience store right by the burning car on clarence road. "One by one" shouts one man as people crowd round to get into the shop, whose entrance has been smashed in. Women calling: can you get me a magazine? Other people asking for alcohol. A photographer is being threatened by a guy and press moving away. But others still smashing in rest of shop front. The situation is highly volatile. A man was just hit over the head with a bottle and punched in the face. A witness said his assailant was a woman. He was left bleeding down the back of his neck. The apparent motive for the assault was that the man was taking photos. But he told police afterwards that he hadn't been doing that when he was targeted, so the circumstances remain unclear. Dozens of youths started the night's violence on Northcote Road at just after nine o'clock when they ransacked a Curry's electronic store in Northcote Road. They were joined by dozens of others, many with black hoods and scarves after a small number of riot police left the scene half an hour earlier when they came under light bombardment from projectiles. Onlookers and locals identified many of those present as "blues, yellows and reds", members of local gangs who they said had called a truce for the evening. Along Northcote Road the windows of other stores in including Starbucks were smashed. The gangs ran along the road and at one point a middle-aged man and his wife pointed in the direction of a jewellers further up the road and other potential targets. Less than 30 metres away dozens of revellers stood outside a local pub drinking beer and looking on. As it became apparent after 20 minutes of looting that the police were not coming back the looters were joined by many more. 10.10pm: Video showing a woman fearlessly telling youths in Hackney to "grow up" in the wake of riots. "I'm ashamed to be a Hackney person," she says. Footage courtesy of Telegraph journalist Matthew Moore - @mattkmoore on Twitter, with thanks to Christian Bennett for the link. 10.16pm: Brixton: Sam Francis is in Loughborough Junction Brixton, where he witnessed 30 youths, faces covered, being chased into the station by two police officers. Police vans and cars were also in pursuit, and blocked the youths inside the station. More as we get it. Here's a picture Sam took of the outside of the station, which my colleague James Ball helpfully uploaded to Twitter. I am shocked by the scenes we are seeing in parts of London and Birmingham. This violence and vandalism is disgraceful criminal behaviour. What we need to see is the strongest possible police response to restore calm and security to our streets and for communities to work together. It is right that the Prime Minister is chairing Cobra. We need a coordinated response to ensure public safety and help those people who have lost homes and businesses. 10.26pm: I've been passed this account from someone who witnessed violence in Walworth, between Elephant and Castle and Camberwell, earlier. They've asked not to be named. I turned up at the Morrisons supermarket branch on Walworth Road, SE17, at about 6.50pm only to find the place shuttered up and one of the few members of staff remaining by the back door telling me that they had closed early as it was due to "go off" in Peckham, four miles away, at 7pm. I left and dropped into a bar to pass on 'the news' only to see BBC World footage on the TV, taken from a helicopter by the look of it, of nearby Lewisham burning, and Peckham soon after. Within minutes, fives and sixes of masked blokes were running past the bar and through to the main street, a handful dumping cars outside the bar on double yellow and charging through to the nearby thoroughfare, which the police had blockaded at the north end in the vicinity of the Tankard pub, along the side road from the police station. Young men and the occasional woman then spent the next hour or so running through the sidestreets with their pickings, the first of them with widescreen TVs, boxes that contained kettle-sized electrical goods, trainers and the like from Foot Locker, and M&S clothing. A white 20-something one with a bad limp came to the door of the bar to ask them to call him a cab. The request was declined. Some of the looters dumped gear in nearby gardens and returned to the Walworth Road, others had filled wheelie bins with whatever and were pushing them home, while the professionals returned to the double-parked cars (BMWs and the like, tinted windows in at least two cases) before replacing their masks and returning for any pickings they may have missed. Innocent people turned up at the bar who had been diverted around the sidestreets, one telling me he saw a gang of about 10 youths throw a man off his motorbike at Albany Road traffic lights before another rode it on in the direction of Camberwell. then the cyclists around him at the traffic lights who tried to help were attacked with weapons by hooded and/or masked vigilantes coming from the vicinity of adjacent Burgess Park. People in the bar who lived on the other side of the Walworth Road were ringing relatives/kids on the other side of it not to open their doors to anyone - it was anarchy in the literal sense of the word. Two police vans finally made it up to Argos at about 8.30pm, which dispersed the people in and outside there sporadically. They had been in there for about an hour though people were still loitering in nearby streets with intent at nightfall. We can only hope that nothing is torched by late arrivals who find themselves empty handed. That, or the police regain control of the thoroughfare. 10.33pm: Audio interview with Matthew Taylor, who is in Croydon. Matt says the scene is one of "burned out cars". Shops have been looted too. Some 300 to 400 people were involved in disturbances. Matt says the police seem stretched with controlling the large fire – which we saw pictures of earlier and is believed to have engulfed a carpet shop – leaving very little presence at all in the areas he has passed through so far. We've detoured to Dalston where a bus was set on fire in shacklewell lane earlier. The single deck bus is now cordoned off and there doesn't seem to be much damage, but the incident has clearly shaken the large Turkish community here. Many shopkeepers are on the street talking about how they chased away the gang of youths behind the bus fire. "We beat up four of them quite badly and they ran off," one man, who wouldn't give his name, said. Another said: "this is not justice, coming here and trying to attack us." Notably several businesses are still open ascot usual here, unlike other violence hit areas. We've just watched a mob of locals chase a gang of hoodies down the main road, with police vans on full siren in pursuit. 11.10pm: ITV are reporting a shooting in Croydon. Vikram Dodd says police are investigating reports but at the moment it is not believed to be linked to the riots. 11.12pm: Video showing looting in Debenhams in Clapham Junction. 11.26pm: Reliable reports of riots now in Camden, Notting Hill and Colliers Wood. Shops and petrol stations have been looted as Colliers Wood becomes another target of youth violence in London. Gangs of well over 100 youths have targeted the Tandem Centre in Tandem Way, where a police van was attacked by rioters throwing bottles and rocks. A standoff has now developed after police withdrew from the Tandem Centre, where the rioters are now trying to break into the shops, which include Sports Direct, JD Sports, PC World and Mothercare. Activity seems to have petered out and it is believed four looters have been rescued by firefighters from PC World. 11.34pm: Good resource for checking situation in various areas. 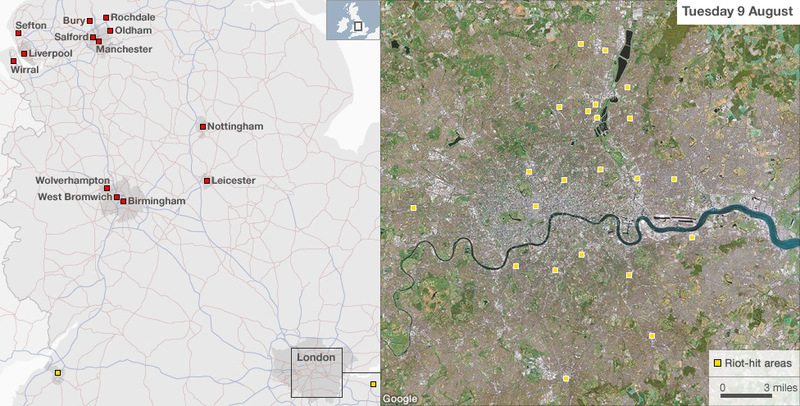 You type in a postcode to see tweets from certain areas - can refine by putting in search terms such as #londonriots. Thanks to colleague Hannah Waldram for sharing the link. • That tweet earlier about Camden being calm. It's not any more. Police and groups charging at each other on Chalk Farm Road. • Group charged the police back, pelting with bottles. One just whizzed past my head. • You get in the wrong place during those charges and it's not cool. • '1 2 3... Raaaah' The police shout and charge the crowd again. Crowd splits. Police retreat. Crowd reforms. I've just returned from Hackney riots and was ambushed just off Essex Road and had my bike snatched by a group of six masked teenagers waiting on Ecclesbourne Road who were shouting "take the bike, take the bike". I was forced to swerve away from them but crashed to the ground. Just as one of the thieves grabbed my bike from under me a red van raced screeched around the corner and smashed into a parked car. Two young men then got out and the man in passenger seat then put his hand in his pocket and threatened to pull a on knife on the thieves, accusing them of stealing his bike earlier. A violent scuffle broke out and the thieves gave up the stolen bikes. Everyone seemed to walk away from the incident, but criminal minded local youths seem to be taking advantage of the lack of police presence due to trouble elsewhere. 12.11am: Ben Quinn reports from Clapham Junction – where a severe looking fire has broken out in a ground floor shop. Ben says hundreds of people have been roaming the area looting. Mostly young, mostly male - some distinguishable as being gang members by the colours of their scarves, Ben says. I've just walked from Liverpool St to Roman Road - so along length of Bethnal Green Road. All a bit of a mess. Shops smashed along Bethnal Green Road including a Cash Converters and an amusement arcade. Small groups of guys wandering around along length of the road. Other groups standing guard outside small shops such as off licences, grocers and newsagents. Far from scenes we're seeing in Croydon or Hackney, but tense. No police on ground there. 12.35am:Simon Brooke was taking his mum out for a birthday meal in Ealing tonight when they and fellow diners became trapped in the restaurant as rioters gathered outside, smashing a window and setting fire to a car. Here's an audio interview with Simon, who said it was "really frightening". Ironically Simon lives in Hackney. He and his family had decided to dine in Ealing as he lives in Hackney and thought it would be safer further west. He has now been advised by police to stay in the restaurant as "gangs may be coming in from the suburbs". 12.39am: I'm getting reports of violence in Liverpool, on Smithdown Road and Lawrence Road. Attempting to clarify. Police blocked the main Gunnersbury Road into Ealing town centre after the disturbances and searched all pedestrians trying to get past to go home. Local residents whose cars had already been smashed by rioters complained that the police had taken no interest in protecting their property and been aggressive. "The rioters who had tried to build a barricade just melted away." 12.52am: ITV news trainee Ben Schofield has confirmed that disturbances are taking place in Liverpool, in the Toxteth area. Also reports of violence in nearby Smithdown Road and Lawrence Road. 1.01am: An unmanned police station has been set alight in Birmingham, Vikram Dodd reports. Vikram said police say there has been disorder in the Handsworth area of the city. The police station which has been set alight is on Soho road. Spent some time this evening talking to a police unit who had been in the fray in Hackney outside Homerton hospital. They had gone to the hospital because three of the officers were injured, none seriously. A sergeant was suffering from concussion after being hit in the head with a brick. Officers described how when another policeman had fallen to the floor, two paramedics had rushed to their aid and were met with a hail of missiles from rioters. The two officers I spoke to had worked 24 hours yesterday, and were into the 15th hour of their shift today and expected to keep on working throughout the night. They had deployed mini vans used only for non-threatening transportation, but which left them vulnerable to attacks from missiles thrown by rioters. "It can feel a bit thankless at the moment, to be honest," said one officer with ten years experience. "It seems that the blame is coming at the police from all sides. But all the officers here would much rather be at home with their families than having bricks chucked at them." Another officer compared the riots to the student demonstrations. "It's completely different. There was some violence then, but you didn't have people basically wanting to murder you." We've just spent about 45 minutes driving around two retail parks on the outskirts of Woolwich, watching gangs of youths looting two stores. As we arrived, a large gang was gathered outside the Stone Lane Retail Park branch of PC World, trying to force open the doors. We made several drive-bys - it seemed to risky to get out and film or speak to anyone - and watched as they gained entry. Within minutes, large flat screen TVs and other electronic goods were being carted out. Some had cars parked nearby to load the goods into. Nearby in another retail park, we saw people carting shopping trolleys full of goods raided from a branch of JD Sports. We drove over boxes of brand new trainers scattered in the road. It felt pretty lawless out there. We didn't seen any sign of police in the 45 mins we were there. 1.23am: Alex Hudson, a BBC journalist who was beaten up this evening and had his phone stolen as he reported on the riots in east London, tells me that as he finally made his way home a group were on their way to Hackney police station, planning to set it alight. 1.28am: BBC reporting that there have been 87 arrests in Birmingham. Merseyside police are advising people to steer clear of Liverpool centre. Stokes Croft was the scene of protests earlier in the year over a proposed Tesco. Paul describes a 70m building engulfed by flames. Unlike the other blazes we have seen over the last few days this fire is in the middle of an industrial estate – it looks as if it may have been targeted, according to Paul. On Twitter @mattburgess1 has shared this BBC image of the blaze. Copycat rioters rampaged through Bristol today with police chiefs warning of "volatile" scenes in the city centre. More than 150 young rioters were causing disruption in the areas of St Paul's and Stokes Croft, the scene of rioting earlier this year amid anger over a new Tesco store. People were warned to stay clear of the city centre as police launched efforts to bring the scenes under control. The cars parked in front of my house have been smashed. There was a small fire in one. I could hear the laughter and what sounded like youthful voices. At least one girl and some guys, they sounded gleeful, if that's possible. When my friend heard (he lives in West Ealing) he ran outside to park his car somewhere safe - had a close shave too. There were gangs of young boys with hoods and scarves roving the streets in gangs near Waitrose. They spotted him but he managed to leave his car and make it back indoors. The Tesco Express in Ealing Broadway has been broken into, Haven Green the park is on fire and the Ealing Broadway shopping mall has been attacked. I can't believe this is happening in Ealing. I've been following the news and heard police sirens and then angry voices. Within an hour all this unfolded. I never expected it to happen in Ealing too. 2.36am: Here's link to another picture of that Sony distribution centre blaze in Ealing - earlier one might be struggling. Thanks to colleague Jonathan Haynes for pic. 2.39am: Tim Samuels, presenter on the BBC Two Culture Show/5 Live's Men's Hour, has sent this video showing people damaging windows at Evans cycles on Chalk Farm Road, Chalk Farm. 2.44am: My colleague Richard Adams reports that the Enfield Sony building, according to its website, is a CD manufacturing plant. "Looters may have thought it was full of PlayStations, in which case they would have been disappointed," Richard says. Sony DADC Enfield, UK offers seamless one-stop-shop distribution services for the United Kingdom. With close ties to the Sony DADC manufacturing company in Southwater, customers are offered a convenient combination and handling of their disc replication and distribution. As your single point of contact, Sony DADC covers the entire supply chain – from the receipt of your input data to the delivery of shelf-ready products to stores. Furthermore, you will profit from the synergies between the close link between our manufacturing and distribution, ensuring that you receive the flexibility you need to respond to market requirements. 2.52am: Matt Taylor has just driven through Crystal Palace on his way back from Croydon, and saw a group of youths there smashing a shop window with golf clubs. He says in almost every area he passed through there were signs of damage – an indication of how widespread the violence has been. 2.57am: Samuel Hunt and Murat Gokmen have shared this footage from Mare Street earlier today, which gives a sense of the edginess and violence in the area this afternoon. 3.02am: Vikram Dodd writes that the Met police have tonight revealed they have used the new tactic of "armoured police vehicles", driven at people to push them back. say they may use it again. 3.06am: A Facebook group has been set up to encourage Londoners to rally round and help with the post-riot clean up tomorrow. "Post riot clean-up: let's help London" was only set up a couple of hours ago but already has over 350 followers and growing. Perhaps some good will come from the riots after all. 3.15am: Right, I'm off home. Thanks for reading and for all the contributions and comments. Hope all are safe. Paul Lewis and Mustafa Khalili are still out reporting from London on Twitter – they're heading to Ealing, where some reports have suggested violence is still continuing, and expect to arrive in about 20 minutes or so. They will both be tweeting – follow them @PaulLewis and @MusKhalili. 3.29am: Good morning, this is Richard Adams taking over live-blogging duties. Although things are quietening down in most areas, there are reports of major police activity in Ealing and disturbances in Southall, although the latter is unconfirmed. Amid the disorder Scotland Yard said it had found a 26-year-old man in a car suffering from gunshot wounds. Police were called at about 9.15pm last night to reports the man had been found injured in Warrington Road, Croydon. A spokesman said: "Two other people, believed to be in their late 20s, were also at the scene. They were arrested for handling stolen goods and taken to a south London police station." Basically, everything started at 10pm. The youngsters gathered by the main road. They were trying to get into the shopping centre, but there were shutters on all the doors. Really mobile groups were coming here. Then the main riot started on this street – New Broadway. This is my friend's bar - Crispins Wine Bar. I was watching from the other side of the road as they started setting alight the fires. The worst was the fire above the Budgens. We saw fights, as the main crowd spread. A few people the mob didn't like, they beat up. One person had a slashed hand. I heard it was done with a knife. I am a builder, and I used planks of wood, whatever I could find in the house, to put over the windows and door of my friend's bar. They rioters got into the wine bar. A few bottles were smashed. The tills were smashed. The shop owner had to escape through the back door. Surreal is a good word I think for this. Hollywood does not know what can happen in real life. 4.16am: This YouTube clip has been doing the rounds and exciting much comment, as you'll understand when you see it. Unfortunately, we don't know any more details – and of course you have take any unverified digital media with a pinch of salt. It appears to have been posted recently - perhaps two hours ago, and seems to have come from today. • What is going on in Britain tonight is a form of terrorism and should be treated as such. Convictions: How tough are they? What has happened in court? What's the impact of a criminal record? At least 400 people have been arrested following a wave of "copycat criminal activity" across London over the past three days, the Met Police said. More than 69 people have been charged with various offences. Three people are being questioned on suspicion of attempted murder after a police officer was injured by a car in Wembley, north-west London, while trying to stop suspected looters. Met Deputy Assistant Commissioner Steven Kavanagh said it was a "shocking and appalling morning for London to wake up to". "The Met was stretched beyond belief in a way that it has never experienced before," he told BBC Breakfast. Acting Commissioner Tim Godwin ruled out bringing in the Army to help police tackle the violence, but said: "We will be out there in ever greater numbers tonight." On Twitter, Scotland Yard said: "In the next 24 hours there will be 13,000 police officers on duty in London." Met commander Christine Jones said the violence was "simply inexcusable"
Groups of people began attacking the police in Hackney at about 16:20 BST, throwing stones and a bin at officers. Police cars were smashed by youths armed with wooden poles and metal bars. 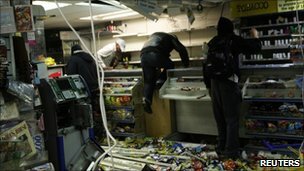 Looters also smashed their way into shops before being dispersed by police. Nine police forces from other parts of the country have assisted in providing support to the capital city, as well as the City of London Police and British Transport Police. Catherine Holmes, a resident in Hackney, said: "The common feeling in Hackney Central is that our community has been hurt and damaged by causeless violence. "We spoke to looters trying to get home - the only explanation they gave for their behaviour was that they had no money today. Ealing resident Christian Potts, 29, was driving through the area when he witnessed the disturbances. "It looks like a war zone - I have never seen anything like it in all my life," he said. "There were about 25 to 30 masked youths on Haven Green and they just started tearing into a florist with bricks. "It's a local family-run business so I can't see why they are doing this." London's mayor Boris Johnson is cutting short his holiday to return to the city. Home Secretary Theresa May also returned early from holiday, to meet Met chiefs to discuss their response to the violence. "These have been the worst scenes of violence and disturbance on our streets for many, many years, and this sort of violence, this level of criminality, this thuggery, this looting, this theft, is completely unacceptable," Ms May told BBC Breakfast. "We can deal with it. We can deal with it with robust policing, with good use of intelligence, but also with the help and support of local communities." She added: "If there's anybody who knows somebody who was out on those streets last night and involved in this action then they should tell the police." The trouble follows two nights of violence over the weekend which started after police shot a man dead in Tottenham. A peaceful protest in Tottenham on Saturday over the death of Mark Duggan, 29, was followed by violence which spread into this week. 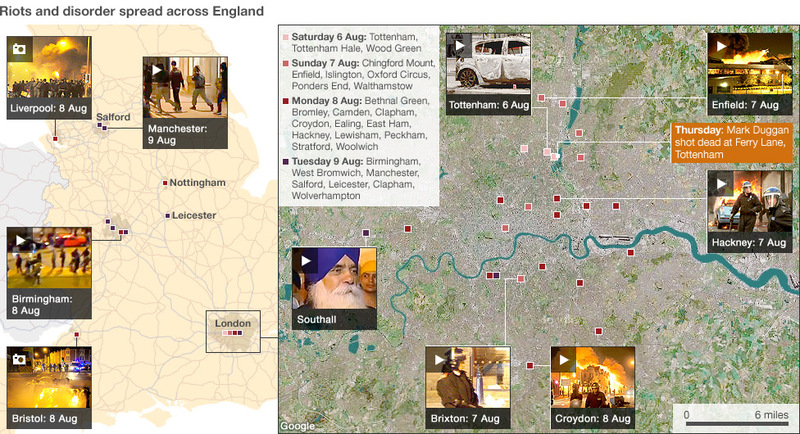 What's the evidence gangs were behind the riots? So what do we know with certainty about the rioters and looters? Are they a criminal, feral underclass or victims of socio-economic blight getting their own back on the rest of society? Sadly, official statisticians and academics haven't thought of a way to measure such things accurately - as my colleague Mark Easton recently pointed out - but the people with the slide rules in the Ministry of Justice have given us the first real picture of the people now filling up the courts and prisons. Their new figures cover those who have appeared before the courts. It may be stating the obvious but if someone hasn't had their collar felt, it is difficult to know a lot about them. What's more - the vast majority of those charged - 1,400 defendants - are still in the system. It will be months before we have the full facts on sentencing. HOW OLD WERE THE RIOTERS AND LOOTERS? What's clear from the initial analysis is that of those who have come before the courts, under 18s account for a larger proportion than they did among those before the courts in 2010. Just over half of all the people who have appeared in court have been 20 or under. Drilling further into that figure reveals that about a fifth were aged between 10 and 17 - and 31% were between 18 and 20. The MoJ looked at the ages of those hauled before the courts for "similar offences" last year and found that 16% were juveniles and 15% were 18 to 20. Statisticians have counted the types of offences, but given that there were no riots last year, they cannot take into account the actual circumstances of the offending. What that means is that there is a danger of comparing apples with pears which becomes more important when we look at sentencing a little later. The key offence so far has been burglary - and that shows why these events were so different to previous bouts of mass disorder. In many past disturbances - think of riots in the 1980s and the 2001 disorder in northern English towns - the target has been the police or other groups, typically leading to lots of convictions for violence-related crimes. This time around, many of those out on the streets were out shopping with a crowbar. While there was still some very serious violence, the charges so far broadly reflect what we all watched live on TV. WHAT SENTENCES DID THEY GET? Only 315 of 1,715 defendants have so far been sentenced because magistrates have been sending so many cases to the crown courts for longer jail terms. The average sentence for violent disorder has been 10.4 months compared with 5.3 last year. The average for theft has been almost three times longer at just over seven months. During 2010, just under a quarter of all burglaries dealt with at magistrates' courts in England and Wales led to an immediate custodial sentence - a percentage that has more doubled for rioters. So more of the offenders are being locked up - and they are being locked up for longer, with the average sentence dished out by magistrates twice the length for similar offences last year. The courts are not treating defendants as ordinary burglars - they are taking into account the aggravating circumstances of the riots. If you want to understand more about how these decisions are being taken, Manchester's top judges issued a very important judgement explaining why they need to sentence rioters and looters for longer. The statisticians say that 45% of juveniles who have appeared have had no recorded criminal history. We've also found out that 73% of all of those brought before the courts have criminal histories. Each defendant with a criminal record has committed an average of 15 offences. Roughly a quarter of them have committed 10 or more offences and about 15% had between six and 10 crimes on their record. This is why Justice Secretary Ken Clarke says the figures vindicate his analysis that the offenders are a product of a penal system that has failed to turn them around. All these previous crimes total 16,598 offences. Just under a quarter were for theft-related offences, but almost 40% were for less serious summary and breach offences. On one level, this could suggest many looters were not serious criminals, but, given the younger profile of those involved, it could also mean the courts are dealing with lots of people whose criminal careers had only just begun. The government's statisticians are drilling further into this data - including an attempt to establish the socio-economic background of offenders. The search for answers is still on. 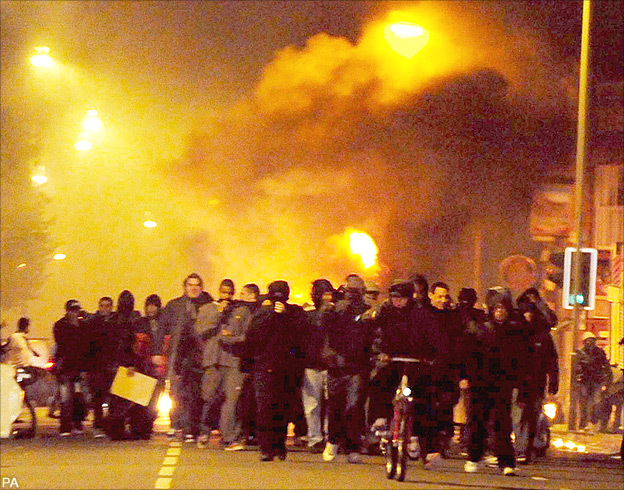 England riots: What is the impact of a criminal record? 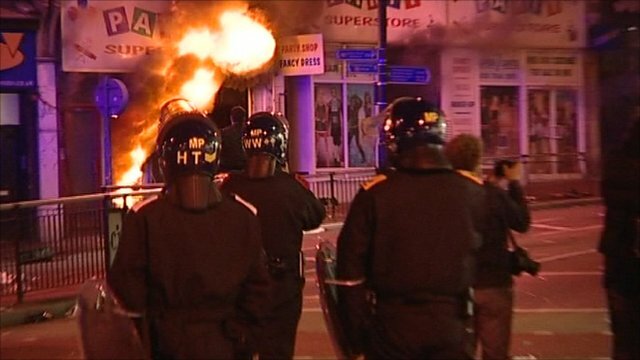 As the courts deal with some of the hundreds of people charged in connection with the riots, igniting a row over whether the sentences being handed out are too harsh, the BBC asks what is the real cost of a criminal conviction? When college student Nicolas Robinson set foot in a Lidl supermarket as he walked home from his girlfriend's house, he probably didn't think his actions would land him behind bars. Robinson, of Borough, south-east London, is now serving six months in jail. Justice campaigners, along with some MPs, have said some of the sentences given to those involved in the riots are too harsh while others have said tough penalties show that disorder does have consequences. But what is becoming clear is that a criminal conviction - no matter how big or small - can have massive implications on a person's ability to lead a full life. "We are seeing a lot of low-value crimes which are going to have a major effect on the lives of the people who committed those offences," said the BBC's legal correspondent Clive Coleman. And Mervyn Barrett, of crime reduction charity Nacro, said many of those who played a part in the riots would live to regret their actions in more ways than one. So what are the practical implications of a criminal conviction? The majority of employers will ask about previous convictions and four million Criminal Record Bureau (CRB) checks are carried out every year in England and Wales, said Mr Barrett, head of resettlement information at Nacro. Vicky Smith's life spiralled out of control aged 15 when she started hanging around with an older crowd and got heavily into drugs and drinking. She racked up more than 30 convictions, including criminal damage, arson and assaulting police officers, and was also sectioned a number of times. Now 36, and more than 11 years after she committed her last crime, she still finds she is excluded from work and volunteering opportunities to teach Taekwondo, the sport she credits with turning her life around. She has been turned away from schools and leisure centres where she lives in Godstone, Surrey, following CRB checks, and says it made her want to "give up". "I'm still not getting the opportunities I want because of these silly offences I did as a teenager, but at the time I didn't care," says Vicky, who has a six-month-old son. "I can't get anything now and I feel I really can make a difference to a lot of young people but I'm not getting the chance. It's so not worth it." Vicky, now a world bronze medallist in Taekwondo, says she hopes that one day employers can see "past the piece of paper that is stopping me from fulfilling my dream". If a person is not asked about previous convictions by a potential employer there is no legal duty to disclose. However, if an employer does ask about an unspent criminal conviction a potential employee must disclose the information. If that person lies it is a criminal offence and they could be prosecuted for fraud. There are large number of professions where convictions can never be spent and must be disclosed, including doctors, nurses, lawyers, teachers and police officers. Mr Barrett said a heightened awareness of criminal pasts came about when criminal record checks were introduced in the 1980s. "Once upon a time you could pick up a criminal conviction and it wouldn't matter because only you and a handful of other people would know about it - employers didn't think in terms of criminal records," he said. "Now we have widespread criminal record checks and I would imagine that in a few years we might have universal record checks. "You can't escape your past as you could previously - it is a major problem." If a person has a job and is sent to prison it is very likely they will lose that job, said Mr Barrett, but even if they are not jailed it is possible to be dismissed for gross misconduct. The tendency is that if a student is applying for health, social care and education courses they will be refused a place if they have a criminal conviction, said Mr Barrett. And if they are already on a course they could be asked to leave. Even a small conviction for fighting or shoplifting can have a major impact, said Mr Barrett. "If you are a young person it's absolutely devastating," he said. "An awful lot of young people are told by the police when they are given a reprimand or caution 'Don't worry about it, it will be off your record in two, three or five years, or when you reach 18 or 21' - none of which is true. "Police officers say this with the best of intentions but if you pick up a reprimand or caution it will show up on your police record for life." Most individual universities or colleges post their disciplinary policies on their websites. There can be difficulties in getting visas or entering certain countries for those with previous convictions. It is always best to check what the situation is before travelling. In particular, travelling to the USA can be an issue. British citizens can usually travel to the country without a visa but if a person has a criminal conviction they will need one and they must provide background about their conviction. If a traveller wants a work or residential permit it can be harder because information about previous convictions and proof of good character is required. "In general (when applying for a visa or permits to live or work) you have to put a criminal conviction in context," said Mr Barrett. "I suspect that if people put their behaviour into context in relation to the recent riots then it's not going to go down too well." As with employers, there is a duty to disclose unspent convictions in an application for a mortgage. If a potential homeowner does not there could be consequences because the mortgage agreement will have been broken. The prime minister has backed plans for people who "loot and pillage their own community" to be evicted from council houses. Wandsworth in London became the first council to serve an eviction notice over the riots, while Nottingham City Council, Salford City Council and Westminster, Greenwich and Hammersmith and Fulham councils in London are all considering the move. A person with previous convictions can find it almost impossible to get any kind of insurance. "The reality is that if your convictions are not spent you will be expected to disclose that and having disclosed it you may well be refused insurance entirely or you may find that premiums are sky high," said Mr Barrett. Mr Barrett said that aside from the practical implications there were often psychological implications - sometimes years after a person committed the crime. "What is always evident from the calls we get is the degree of shame people feel about their past behaviour," said Mr Barrett. "Shame and embarrassment is often a greater problem than the practical problems offenders face. "Those people involved in the recent looting and rioting who are being processed by the courts at the moment - many of them are going to spend the rest of their lives either regretting [their behaviour] or finding that it comes back to haunt them from time to time because in a world with criminal record checks you really can't escape your past." Looters target shops and set cars ablaze in Salford, then move on to Machester city centre, Ed Thomas reports. Violence flared in Liverpool overnight as hundreds of rioters marauded through the streets to the south of the city centre. Violence spreads to Birmingham, where looters take stock from an electrical store. Claire Marshall reports. Police fought running battles with youths in Brixton hours after a music festival ended, journalist Paraic O'Brien, tells BBC Radio 5 Live. 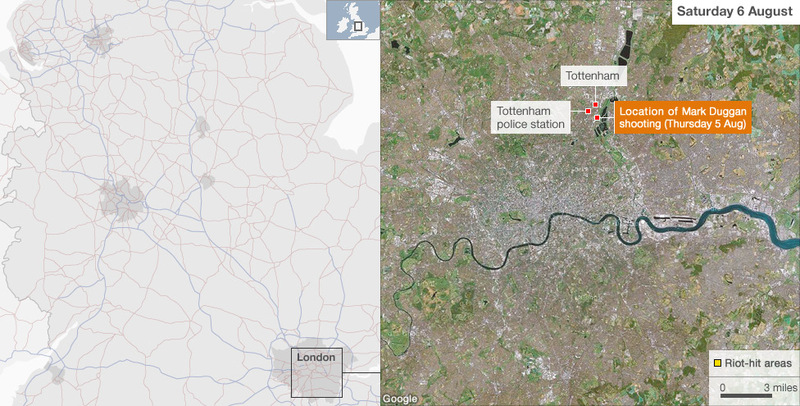 Petrol bombs are thrown at police and three patrol cars, a bus and buildings are set on fire in the first night of disturbances in Tottenham, north London, Andy Moore reports. A Sony distribution centre in north London is engulfed by flames as violence continues. Tommy Thompson, who works in a neighbouring hotel, told BBC News what he saw. Riots in London and around the country saw widespread looting and buildings set alight. 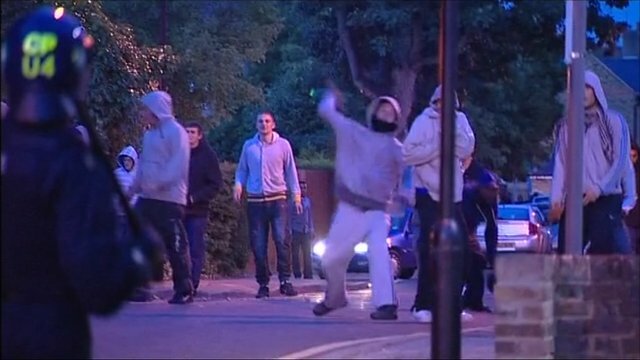 Dozens were left homeless after a night of riots on the streets of Tottenham after a peaceful demonstration on 6 August over the death of a man who was shot by police turned violent. Here is a timeline of what happened, starting with most recent events. 00:22 BST - The Metropolitan Police say 1,103 people have now been arrested in connection with the riots and 654 people have been charged. Greater Manchester Police said they had so far made 147 arrests and more than 70 people had already gone through the courts. Merseyside Police said they had made 77 arrests and charged 45 people. West Midlands Police said 445 people had been arrested and Nottinghamshire Police said they had arrested 109 people and charged 69. The night passes off peacefully - with officers still on the streets in large numbers. 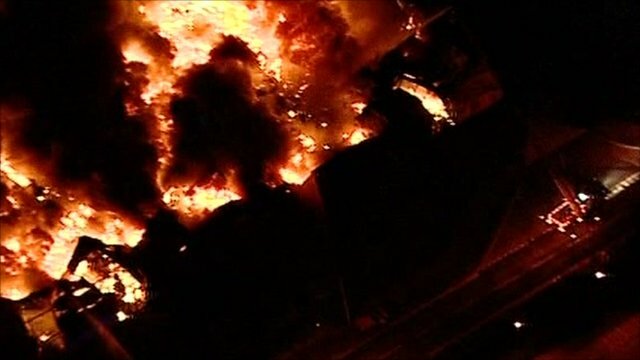 21:50 BST - Metropolitan Police now say 1,009 people have been arrested in connection with the riots - and 464 have been charged so far. 20:04 BST - The debate concludes and the Commons adjourns. It will re-convene next month. 19:48 BST - Concluding for the government, Education Secretary Michael Gove says a "culture of rootless hedonism" has taken root in some parts of society but the last week has shown the "worst and best of our country". 19:38 BST - Summing up for Labour in the Commons, shadow education secretary Andy Burnham says Parliament has spoken for the "majority" in the country in condemning the violence of the last few days. 18:09 BST - Scotland Yard says it has arrested a 20-year-old man on suspicion of robbery, in connection with the attack on Malaysian student Asyraf Haziq. West Midlands Police says it has arrested three men over the deaths of three people in the Winson Green area of Birmingham. A 32-year-old man arrested earlier over the case is released on bail. 17:02 BST - MPs are continuing their debate in the Commons - it has now been extended until 20:00 to ensure everyone gets their say. 11:55 BST - Labour leader Ed Miliband calls for an inquiry to look at the deeper causes of the "wanton vandalism and looting". He says the riots have been a "stark reminder" of the need for police on the streets and he calls on the government to rethink cuts in police spending. 11:30 BST - Prime Minister David Cameron makes a statement to MPs in which he admits there are questions to be answered over the shooting of Mark Duggan in Tottenham last week. He calls the rioting "criminality, pure and simple" and says the courts will continue sitting for as long as necessary to deal with the extra cases. He says police will be given powers to force people to remove masks and scarves covering their faces where there are reasonable grounds to believe they are planning criminal activity. Mr Cameron also announces a £10m recovery scheme to make areas safe and clean again. 11:15 BST - The Premier League match between Tottenham and Everton at White Hart Lane, scheduled for this weekend has been postponed, amid fears of further unrest. 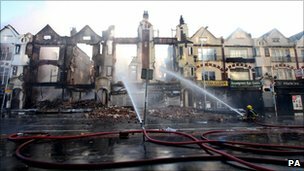 10:57 BST - Housing minister Grant Shapps says 100 families have been made homeless following the disturbances. He says he is looking at measures to prevent rioters from being given social housing. 10:00 BST - MPs have been recalled from their summer break for an emergency debate on the riots. 06:27 BST - The Metropolitan Police say the total number of arrests in London is now 888 in connection with the rioting and looting - and of those, 371 have been charged. 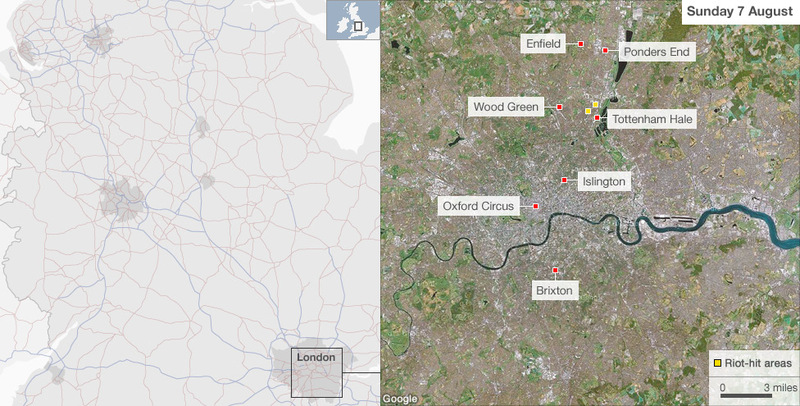 London and other cities affected by the recent rioting have remained largely calm overnight. 01:50 BST - A candle-lit vigil held in Birmingham at the spot where three men were killed on Wednesday night when they were hit by a car passes off peacefully. About 250 people took part. Police have been given more time to question a 32-year-old man on suspicion of murder. 23:55 BST - Magistrates courts in London, Solihull and Manchester among others stay open through the night to fast track those already in custody for disorder related offences. 22:03 BST - In a statement, West Midlands Police say the situation across the area is calm at the moment as 1,000 officers parade the streets. 21:51 BST - Scotland Yard has named the 26-year-old man who died after being found shot in a car during riots in Croydon as Trevor Ellis, of Brixton Hill. 19:36 BST - Tariq Jahan, whose 21-year-old son, Haroon, died after he was run over by a car in Birmingham, has called for people not to resort to vigilantism against rioters and asked his community to ''stand united". 18:19 BST: - Greater Manchester Police's twitter feed confirms that two men have been sentenced to 10 weeks and 16 weeks over rioting. 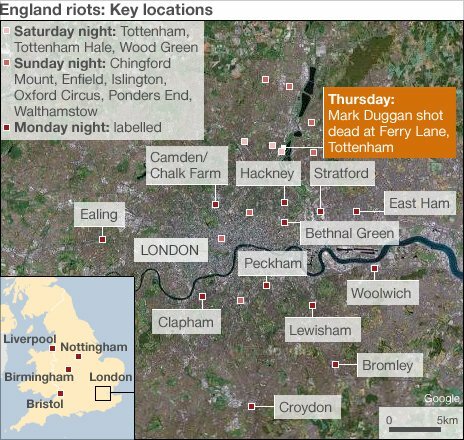 17:59 BST: - In London, the number of people arrested in connection with violence, disorder and looting rises to 805, with 251 charged, Scotland Yard says. 16:31 BST - The Association of Chief Police Officers - which is co-ordinating the transfer of police officers, dogs, horses and other riot equipment - says six forces have requested assistance tonight. They are: Avon and Somerset, Gloucestershire, Greater Manchester Police, Metropolitan Police, Nottinghamshire and West Midlands. Fifty-one forces across the UK are helping supply the extra officers and equipment. 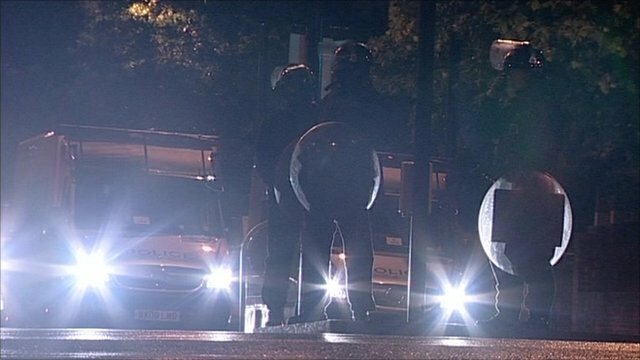 14:44 BST - Scotland's First Minister, Alex Salmond, says 250 police officers have been dispatched from Scotland to the Midlands and the north of England to help combat the rioting. 13:43 BST - Ministry of Justice statement says there are enough prison places for all those sentenced to custody. The Met Police release a second tranches of images of people they would like to speak to about the recent disorder. Greater Manchester Police release a batch of CCTV images of suspects wanted in connection with the rioting and looting. 11:15 BST - Prime Minister David Cameron makes a statement from Downing Street, paying tribute to police and the emergency services. He warns that more people will be arrested and charged. He said: "We will not allow a culture of fear to exist on our streets." Mr Cameron also said there were contingency plans for water cannon to be used at 24 hours' notice. 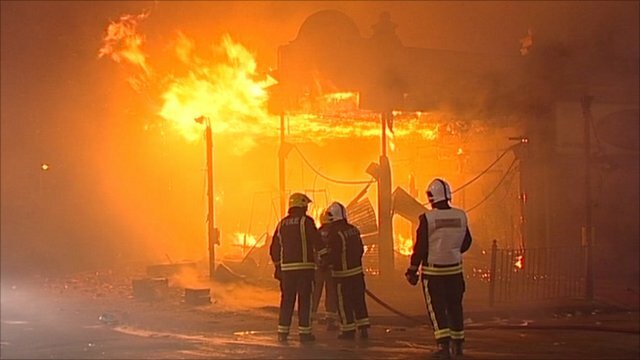 09:13 BST - A 21-year-old man is arrested on suspicion of starting a fire at the House of Reeves furniture store in Croydon - destroyed during Monday night's rioting in London. 05:37 BST - A murder investigation is launched in Birmingham after two men are killed and one critically injured in a hit and run incident. The third man later died in hospital. It is not known if the deaths were linked to the rioting. 04:00 BST - Avon and Somerset Police say four people have been arrested following disorder in Bristol city centre. 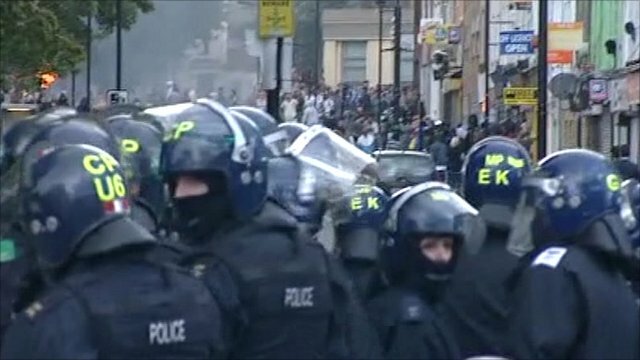 00:24 BST - The Metropolitan Police say 685 arrests have been made in connection with the riots across London. Of these, 111 people have been charged - 69 with burglary. Greater Manchester Police say they made 47 arrests, Merseyside Police 35 arrests and West Midlands police 87 arrests on Tuesday night following trouble in Birmingham, West Bromwich and Wolverhampton. 22:36 BST - A police station in Nottingham is firebombed by a group of rioters. In the Bootle area of Merseyside a man is arrested on suspicion of vehicle theft after allegedly using a dumper truck to break into a Post Office. 19:28 BST - Manchester police appeal for calm following a number of attacks by rioters on shops in Manchester city centre and Salford. There are also reports of trouble in Birmingham and West Bromwich where there have been confrontations between police and gangs of youths. 17:46 BST - Reports of rocks and stones being hurled at police vans by gangs of youths in Salford, Manchester. 17:29 BST - The Independent Police Complaints commission says ballistic test results show no evidence that a hangun found at the scene of the fatal police shooting of Mark Duggan had been fired. 15:24 BST - Scotland Yard says 525 people have been arrested in relation to the riots. Ninety-nine people have been charged so far - of those 63 face burglary charges. 14:45 BST - London Mayor Boris Johnson visits Clapham Junction to thank volunteers for clearing up the damage and apologise to those who have lost their businesses. He is heckled by angry residents who say there were inadequate police on the streets. 14:15 BST - Prime Minister David Cameron visits Croydon to view the devastation from Monday's violence and looting. 11:06 BST - David Cameron makes his first statement outside Number 10 after cutting short his holiday to return to London. He announces a massive increase in police numbers and the recall of Parliament. 09:55 BST - The Football Association confirms that England's friendly against Holland at Wembley tomorrow has been called off because of the rioting in London. 09:43 BST - London Fire Brigade says it faced its busiest night in recent history. The brigade's 999 control centre answered 2,169 calls between 18:00 BST on Monday and 07:19 BST on Tuesday. This is around 15 times the normal rate of calls the brigade would expect on an average day. 03:06 BST - London Fire Brigade lists the major blazes is it fighting in the capital: 1. Timber yard fire ongoing in East Ham on Plashet Grove. Four fire engines and 20 firefighters on site. 2. Shopping centre and offices of four floors fire on Woolwich New Road. Whole of the ground floor is alight. 20 firefighters attending. 3. The fire on Lavender Hill now has eight fire engines and 40 firefighters at the scene. Most of the ground floor and part of first floor alight. 4. 40 firefighters at a fire in a warehouse on Solar Way in Enfield. 01:21 BST - The Metropolitan Police issue on their current operations across London. It includes the following bulletins - Hackney: 250-300 people gathered in Pembury Estate, setting alight cars and throwing petrol bombs. Businesses in Mare Street were looted and officers contained the situation. Three officers injured but their condition is not believed to be serious. Newham: Looting in Stratford High Street. Lewisham: Roaming groups of youths were involved in disorder. Bethnal Green: More than 100 people looted a Tesco supermarket. Two officers were injured. Croydon: Fires burning at a number of premises, including a very large blaze at a sofa factory. 01:05 BST - BBC staff member reports hundreds of youths ransacking a Panasonic store in West Ealing - no sign of police. 00:59 BST - Merseyside Police confirm they are dealing with a number of incidents in South Liverpool, including cars being set alight. 00:45 BST - West Midlands Police confirm that a police station in Holyhead Road in Handsworth, Birmingham, is on fire. 23:49 BST - Labour leader Ed Miliband is returning early from his holiday in Devon because of the riots, it is reported. He is due back in London on Tuesday morning. 23:30 BST - About 40 vehicles were damaged in a night of violence in Nottingham described by one senior officer as "motivated" by the London riots. Most of the incidents happened in the St Ann's area, but police foiled an attempt to break into the Victoria Centre in the city centre. The trouble lasted about three hours. 23:27 BST - Rioting is taking place in Ealing, west London, where the windows of a Tesco supermarket have been put out, a car is on fire and rubbish is strewn in public areas. There is also a fire in Haven Green park, opposite Ealing Broadway Tube. 23:05 BST - A BBC producer reports that phone shops are being looted in Woolwich High Street. He says there are several hundred youths involved, but there are no police around. There is also a burnt-out police car. 22:42 BST - Essex and Suffolk Police confirm they have sent officers to London to assist Metropolitan Police colleagues. 21:50 BST - A BBC correspondent reports seeing a fire burning in Clapham High Street but he can't see any police besides a police roadblock further up the road. 21:33 BST - The Prime Minister is to cut short his holiday because the situation has "demonstrably worsened", it is reported. 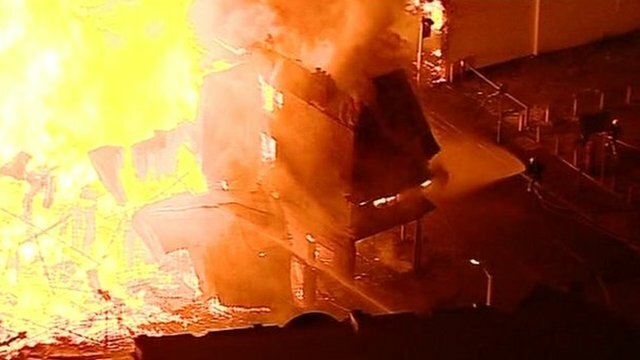 20:58 BST - Aerial footage is now showing several fires burning in Croydon, south London. 20:07 BST - West Midlands Police say some shop windows have been smashed in various locations, with property stolen. 18:45 BST - Video footage from Lewisham, south London, shows a fire burning in a street where at least one vehicle has been set ablaze. 18:42 BST - Transport for London says a bus has been set on fire in Peckham, south-east London. 17:39 BST - Spokesman for Mayor of London Boris Johnson says he is interrupting his family holiday to return to the capital to deal with the situation. 17:19 BST - Skirmishes break out between police and groups of young people in Hackney. The trouble reportedly started when a man was stopped and searched by police, but nothing was found. 06:15 BST - The Metropolitan Police say a further 100 arrests have been made and 16 people charged in relation to disturbances overnight on Sunday. 02:38 BST - The London Fire Brigade says firefighters have been called to a number of fires as a direct result of disturbances in the Enfield, Brixton and Walthamstow areas. Six fire engines and 30 firefighters are fighting a blaze at a shop on Brixton road. 02:20 BST - Scotland Yard says police are responding to copycat criminal activity across London. In a statement it says "small and mobile groups" of looters have been have been targeting areas of north, east and south London. Police say gangs of youths are continuing to attack officers and shops are being targeted in Waltham Forest. In Enfield, the High Street remains cordoned off after disorder in the area was contained. The situation in Walthamstow is said to be under control after some 30 youths - many in masks - vandalised and looted shops there. 00:45 BST - Six fire engines and 30 firefighters are despatched to a blaze at a Foot Locker store on Brixton Road, after it is set alight. Three officers are injured after being hit by a vehicle in Chingford Mount, Waltham Forest. The officers had been making arrests after a shop was looted. Police say a police vehicle windscreen was smashed during a disturbance in Islington and a Tesco store in Ponders End has been vandalised and looted. 22:30 BST - Reports on Twitter of a police presence at Oxford Circus in London's West End. Police later say a mob of around 50 people damaged property in the area. 22:00 BST - More reports of shop windows being smashed in Enfield. Riot police and mounted police patrol the streets. 21:30 BST -The Guardian newspaper quotes a source as saying a bullet found in a police radio after Mr Duggan's death was police issue. 19:45 BST - Around 100 hooded youths gather outside Enfield Police Station. 18:30 BST - Three police officers are injured after intervening in an altercation in Brixton, south London. Missiles are thrown. 18:28 BST - Police are called to High Street Enfield after reports shop windows are being smashed. A police vehicle is damaged. 16:20 BST - Police announce the launch of Operation Withern to investigate the riots in Tottenham. 12:00 BST - Fire crews have all the fires under control but are still damping down some burnt-out buildings. Scenes of crime officers begin investigating and gathering evidence. Police say 26 police officers were injured in the riots and two remain in hospital. In total, 55 arrests have been made. Local MP David Lammy tells reporters the community has "had the heart ripped out of it" by "mindless, mindless people", many of whom, he says, had come from outside Tottenham to cause trouble. 22:45 BST - As the violence continues, a double-decker bus is burnt out and more petrol bombs are thrown at police and buildings. Shops set alight in the area include an Aldi supermarket and a carpet shop. Looting is reported throughout the night and some thieves take the opportunity to load up car boots and shopping trolleys with stolen goods. Vision Express, Boots, Argos and JD Sports are among the shops affected. 20:45 BST - The London Fire Brigade receives its first calls to attend and by 04:30 BST the following morning has dealt with 49 "primary" fires in the Tottenham area and received more than 250 emergency calls from the public. 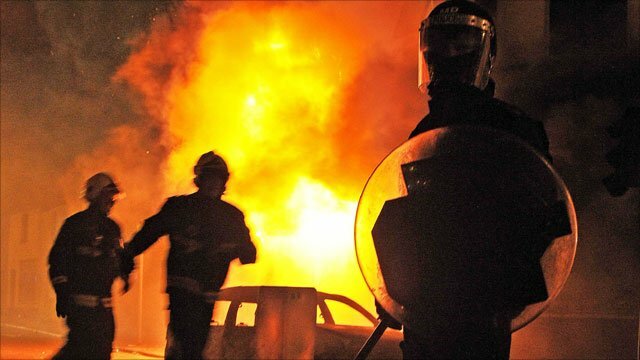 No firefighters are injured in the disturbances but some are threatened by rioters, according to the London Fire and Emergency Planning Authority. 20:20 BST -The violence begins as bottles are thrown at two patrol cars close to the police station. One of the vehicles is set alight, while the other is pushed into the middle of the road before also being torched. Unconfirmed reports say the incident was sparked off by a confrontation between a teenage protester and a police officer. Riot officers from the Territorial Support Group and police on horseback are deployed to disperse the crowds but come under attack from bottles, fireworks and other missiles. 17:00 BST - Around 300 people gather outside Tottenham police station after marching from Broadwater Farm estate. They say they want "justice" for Mr Duggan and his family. Officers are forced to close the High Road and put traffic diversions in place. Eyewitnesses report that the protest begins peacefully. Before 17:00 - The IPCC provides support to 14 of Mr Duggan's family members and friends as they formally identify his body. 18:15 BST - Mark Duggan, 29, is shot dead by police at Ferry Lane, Tottenham. The death occurs during an operation where specialist firearm officers and officers from Operation Trident, the unit which deals with gun crime in the African and Caribbean communities, are attempting to carry out an arrest. Mr Duggan is a passenger in a minicab and is shot after an apparent exchange of fire. 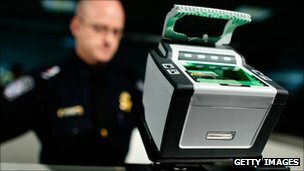 A police officer's radio is later found to have a bullet lodged in it. The Independent Police Complaints Commission (IPCC) announces it will investigate the incident and later says it believes two shots were fired by police. It also confirms that an illegal firearm was recovered from the scene. Saturday 6 August: A crowd protest outside Tottenham police station demanding "justice" for Mark Duggan's family. Later, two police cars are attacked and set on fire. A bus and shops are also set alight and violence continues into the night. Sunday 7 August: Looting continues in Tottenham into the early hours and spreads to the nearby Tottenham Hale Retail Park. 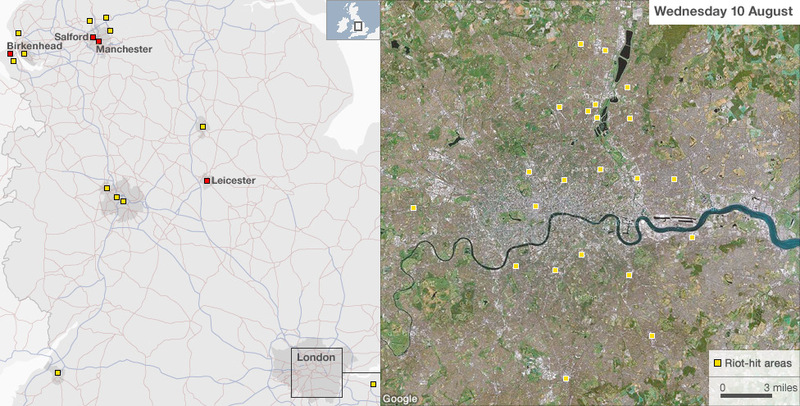 Trouble also flares in Enfield in north London and Brixton in the south as well as other areas of the capital. Monday 8 August: Calm returns to London in the morning. As evening falls, looting and violence erupts across the capital. Hackney is first, swiftly followed by other parts of London including Croydon which saw some of the worst violence. Trouble also flares in Bristol, Nottingham and Birmingham. Tuesday 9 August: London is flooded with extra police and remains calm. 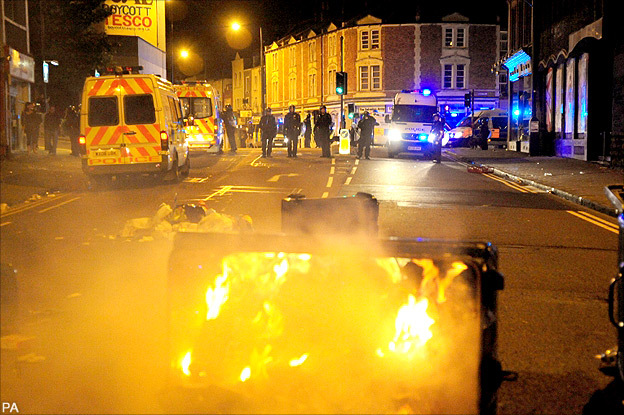 Rioting and looting sweeps through parts of north-west England and the Midlands. Manchester, Liverpool, and Birmingham witness some of the worst violence. Wednesday 10 August: Looting and clashes with police continue into the early hours in many areas outside the capital. London remains calm. Meanwhile hundreds are arrested in the capital and elsewhere as the clean-up continues. A peaceful protest demanding justice for a man shot by police was the catalyst for the violence that has spread across the country. Mark Duggan was killed in Tottenham, London, on Thursday 4 August after police stopped the car in which he was a passenger. Saturday's protest march sparked unrest and by the end of the night Tottenham was ablaze, with cars and shops set on fire and looters running free. More disturbances took place on Sunday night, but it was on Monday afternoon that they began to escalate. 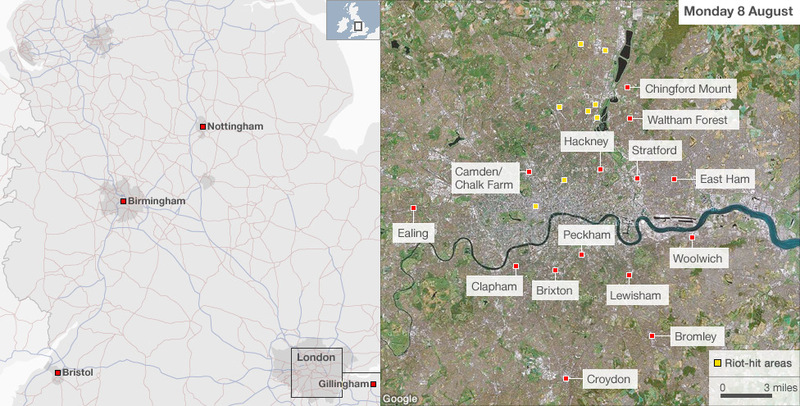 The violence spread first to Hackney, then to Lewisham, Peckham, Woolwich, Ealing, Clapham and then to major cities outside London. On Tuesday, an extra 10,000 police meant the streets of London were quieter but rioting and disorder took hold in Manchester, Birmingham, Nottingham, Wolverhampton and Liverpool.